1937 CCC Annual is something you should read. 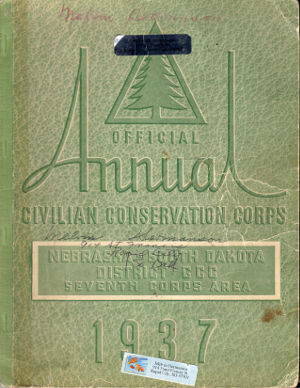 This 1937 Official Annual Civilian Conservation Corps Nebraska-South Dakota District CCC Seventh Corps Area was donated by CCC man Melvin Hermanson. It contains a lot of information about the camps and companies that were active at the time. The history of the seventh corps area is included. 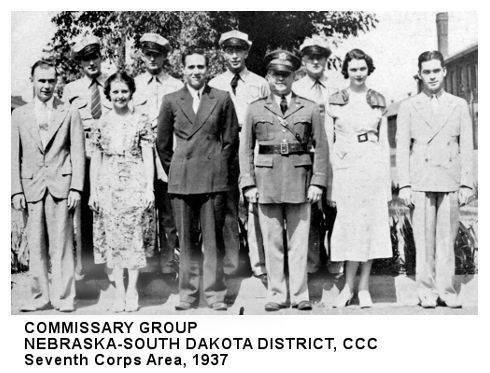 Just one of the photos in the annual is of the COMMISSARY GROUP NEBRASKA-SOUTH DAKOTA DISTRICT, CCC, Seventh Corps Area, 1937 and lists the names. Front Row, Left to Right: George Slimm, Chief Clerk; Marguriette Ely, Typist; Raymond DeHart, Clerk; Lieut. L. T. King, Sales Officer; Mary Kane, Stenographer; Ralph Williams, Shipping Clerk. Back Row, Left to Right: Orvel Parsons, Clerk; Roy Stevens, Warehouse Foreman; Wayne Moore, Warehouseman; Herbert Kupfer, Warehouseman. We have digitized the pages and converted the annual to PDF. 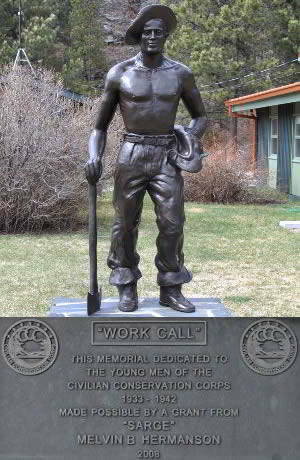 It has been printed for viewing at the Civilian Conservation Corps Museum of South Dakota.